Peaches are a healthy fruit used in pies, cakes, yogurt and other foodservice operations. They can be served in salad bars and buffets for a nice dessert or used as pie fillings. Your bakery patrons will love freshly baked peach pies on the menu. Daycares can serve peaches for the kids as a healthy snack at lunchtime. Buy your wholesale peaches from the leader in restaurant supply. We stock light syrup peaches, sliced peaches, diced peaches, and more. Del Monte Peach Sliced Lite - 8.25 Oz. Del Monte Lite Diced In Pear Juice Peaches Yellow Packed - 105 Oz. Dole Diced Peach In Light Syrup - 4 Oz. Dole Peach In Strawberry Gel - 4.3 Oz. Dole Peach Sliced In Light Syrup - 7 Oz. Fruit Sliced Yellow Cling Peaches - 8.5 oz. Fruitblendz Peach Sauce - 68 oz. Yellow Cling Peach Halves - 29 Oz. Musselmans Diced Peach Pizza Topping - 114 Oz. Lovin Spoonfuls Peach Slices Light Syrup - 105 oz. 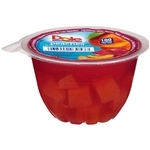 Delmonte Plastic Fruit Cup Diced Peaches In Light Syrup - 4 Oz.